ZypMedia powers programmatic advertising for the world’s leading media companies. ZypMedia was built from the ground up for solving the complex challenges media companies face with offering digital solutions. ZypMedia’s omnichannel platform allows you to create a custom solution (with many tactics) for each client. ZypMedia doesn’t go after the same advertisers you serve. Our goal is to enable your sales team to be digital champions. ZypMedia has helped us bring a completely new dynamic to our regional sales mix. Its digital solutions help our advertisers reach far more of their desired target audience than ever before to get results for their business. Clients love ZypMedia’s reporting dashboard and real-time reporting! Both are critical differentiators that help us win new business and keep existing advertisers coming back. WACH FOX sells an incredibly complicated local digital offering—with moving parts around everything from overall strategy to creative and media optimization. 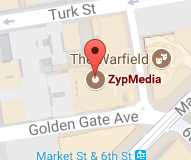 ZypMedia’s world-class technology, expertise, and teams give us the capabilities and support we need to make the complex local marketing achievable—and more profitable than ever before.